Harmful emissions of nitric acid and fine particles, which are already far above the thresholds, are a daily part of inland navigation. Many regulations have attempted to change this and introduce limits in order to make electrically-powered ships more than attractive. As a specialist in electric drive technology, Ampereship offers concepts for equipping your barges, ferries and working vessels, for example. The ships are subsequently either emission-free or produce a significantly reduced amount of emissions. The European Parliament has adopted new emission limit values for non-road mobile machinery and devices, which include all barges. Therefore, all engines introduced to the market must, as of 2020 at the latest, comply with the Euro 5 threshold. These regulations call for a change in views regarding the choice of propulsion in all ship types. Fully electrical solutions or hybrid solutions are the technology of choice when it comes to ensuring that ships are in line with the new norms. Thanks to its suitable components, systems and experience as a system provider, Ampereship is the partner for shipyards, system integrators and ship owners. With a fully electric propulsion, the electric motor is directly powered from the batteries and, for this reason, produces zero emissions. A mass-produced diesel-electric hybrid drive has another generator (petrol/diesel) or fuel cell which provides the former with electrical energy and which, thanks to its complete decoupling of the drive, allows this to be operated at a very good level of effectiveness. In addition to this, the variants offer the option to drive the ship exclusively using electricity, thus producing zero emissions. For a completely electric ride, the propulsion system is fitted with lithium polymer batteries which can be charged from the drive system on-board or via a shore power. These absorb the diesel engine's performance peaks and render additional red diesel unnecessary. The advantages of Ampereship's battery-powered electric ship solution lie in the whole concept based on the extensive experience in ship propulsions as well as on highly efficient electric motor. The propulsion system's level of effectiveness can be up to approximately 98 percent. Travelling with zero emissions is extremely important, especially as neither noise nor pollution affect the pleasure of driving. Not only can a hybrid version significantly reduce the fuel consumption, it can also reduce noise and vibrations. An additional advantage is the improved effectiveness of the diesel engine. Together with its strategic partners, such as battery manufacturers, Ampereship offers a complete solution for fully electric or HYBRID drive and automated systems. 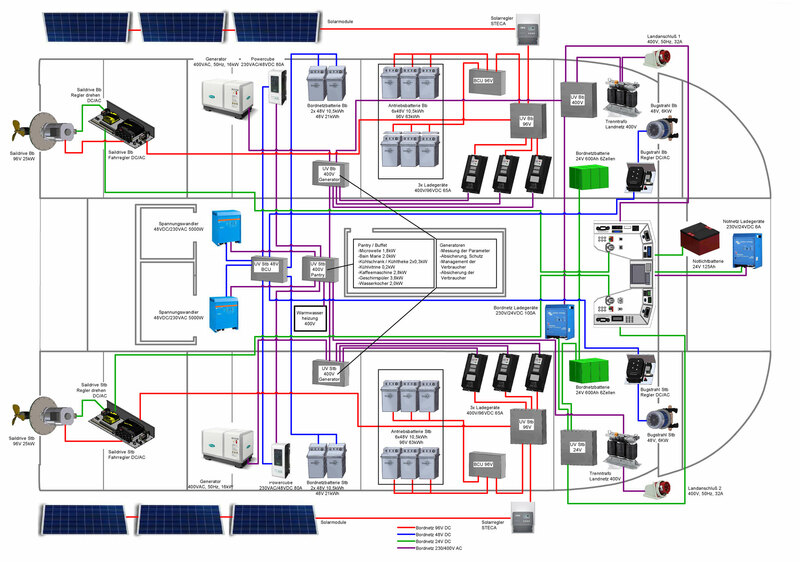 The Ampereship complete solution includes own-brand electric motors, scalable lithium polymer batteries with an energy management system, convertors, switch cabinets and steering gears. The battery-powered electric propulsion system is of course redundantly designed as required by law. Ampereship has an effective, tried and tested concept for hybrid and fully electric ship propulsions which equally fulfil the requirements of both shipping companies and law-makers. The technology is more than suitable for commercial shipping. Don't miss your chance to keep up-to-date as the change to quiet and environmentally-friendly propulsion has already begun.